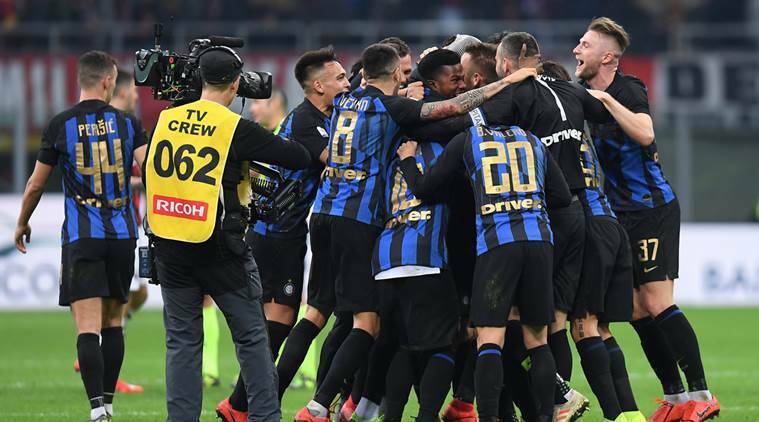 Crisis-hit Inter Milan enjoyed a morale-boosting 3-2 win over AC Milan in an entertaining Derby Della Madonnina on Sunday to move back above its city rival in the Serie A standings. Matias Vecino and Stefan de Vrij scored at the start of each half for Inter, and Lautaro Martinez converted a penalty, either side of Milan goals from Tiemoue Bakayoko and Mateo Musacchio. Inter took the lead with less than three minutes on the clock. Lautaro headed down a cross from Ivan Perisic and Vecino was left unmarked to volley the ball into the roof of the net. Inter extended its lead six minutes after the break when, following a short corner, De Vrij headed in Matteo Politano’s cross. Without Cristiano Ronaldo, Juventus fell to its first Serie A defeat of the season as it lost 2-0 at Genoa on Sunday. Substitute Stefano Sturaro, who was sold by Juventus in January after a lengthy injury spell, scored two minutes after coming off the bench for his Genoa debut and Goran Pandev sealed the result. It was Juve’s first league defeat since April but Massimiliano Allegri’s side still has a commanding advantage at the top of the table. Second-placed Napoli trimmed the gap to 15 points as it fumbled a two-goal advantage over Udinese but recovered to win 4-2. Atalanta’s European hopes were damaged by a 1-1 draw at home to bottom club Chievo Verona. Atalanta slipped to seventh, six points below Milan and level on points with Lazio, which beat Parma 4-1. Coach Aurelio Andreazzoli steered Empoli to a 2-1 win over fellow struggler Frosinone in his first match back in charge.